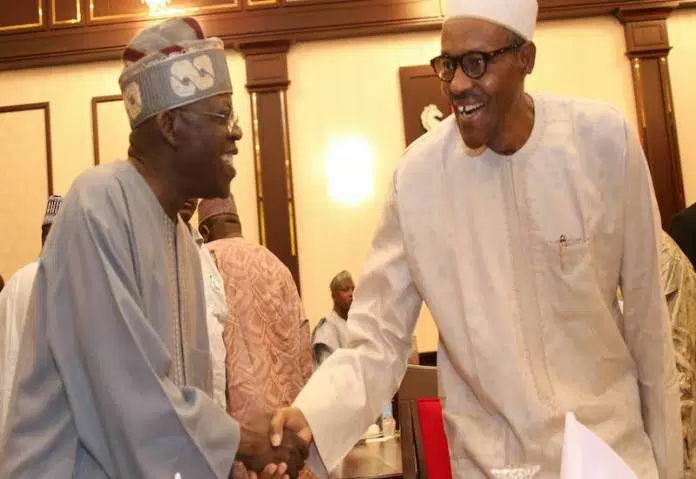 Confronted by apparent and prevalent internal squabble in the ruling All Progressives Congress (APC), President Muhammadu Buhari on Tuesday named Senator Bola Ahmed Tinubu as the leader of fresh reconciliation efforts in the party. The appointment of Tinubu for this onerous task is obviously a smart and well thought-out initiative by the president as Tinubu himself had been in the news until late last year as one of those perceived to be aggrieved in the party, having been allegedly sidelined by the president since he assumed office in 2015. Following his perceived grievance, suspicions have been rife that Tinubu whose delivery of the South-west to Buhari was the major factor which heralded Buhari’s victory at the March 28, 2015, presidential poll, may not be disposed to repeating the same feat come 2019. The president had mainly failed in three consecutive presidential polls between 2003 and 2011 because his performances in the South had always been abysmal as the North alone could not guarantee his victory no matter the degree of his performance and popularity in the region. However, as a result of the perception that Tinubu was unhappy over the way he was treated after Buhari’s election, the former Lagos State governor who had been under intense criticism for delivering the South-West to APC in 2019, might have issues to contend with should Buhari throw his hat in the ring in the end. Naming him as the chief reconciliatory officer of the party therefore, as the political activities towards 2019 polls gather momentum, is strategic as it amounts to putting him on the spot and making the support of South-west for APC in 2019 promising. In a terse statement issued by the Senior Special Assistant to the President on Media and Publicity, Malam Garba Shehu, yesterday, Buhari gave Tinubu’s terms of reference to include: leading consultative and reconciliatory moves aimed at rebuilding confidence in the party. Buhari also assigned Tinubu the responsibilities of resolving existing disputes among party men and women as well as between party leadership and political office holders in some states. “As part of on-going efforts to improve cohesion within the APC, President Buhari has designated Tinubu to lead the consultation, reconciliation and confidence building efforts. “The assignment will involve resolving disagreements among party members, party leadership and political office holders in some states of the federation,” the statement said. Given these responsibilities, the job of Tinubu is tasking as the crisis in APC is endemic. First, there are party men and women who felt betrayed by Buhari for allegedly leaving them in the cold after working assiduously for his election. Secondly, there are others who have had running battles with their benefactors within the party in some states. A good example is the acute face-off between Kano State Governor, Ibrahim Ganduje, and his benefactor, Senator Rabiu Kwankwaso. Kwankwaso was last week forced to put off his proposed rally in Kano following a stern warning from Ganduje that his security could not be guaranteed in the state that he governed for two different terms. Yet, it was Kwankwaso who unilaterally brought Ganduje and installed him as his successor in the same APC in 2015. How Tinubu will pursue his mission and achieve the desired goals and objectives therefore remains an issue to watch out for.. Meanwhile, mixed reactions yesterday trailed the news of Tinubu’s appointment. While some lauded the appointment, the general consensus however was that the government of the day finally remembered Tinubu because of the forthcoming general election. Usman Ibrahim said: “I want to believe Buhari has something on Tinubu and willing to use it if he (Tinubu) does not play ball. Gege Best said: “I think the lesson for the future is clear. It is not enough to build alliances to gain power. It is important to understand the characters with whom you have joined forces. Freke Idio added: “The president is a great player, he knows he has already lost election in Benue, Gombe, Taraba, Nasarawa States.